Last Sunday (30 March) was the kick-off of the project. We were going to build a vegetable garden and vertical garden from plastic bottles. After talking to people from the neighbourhoods and organising workshops on how people wanted to see their streets, it was clear that one of the most popular ideas was more green in the streets. Preferably a big park. That is something I couldn’t achieve now, so we started small. When starting this Sunday a few adults and a lot of kids came out to help. Most of them live with their families in hijacked buildings. This means that they are living there illegally and are still paying rent to the illegal landlords. 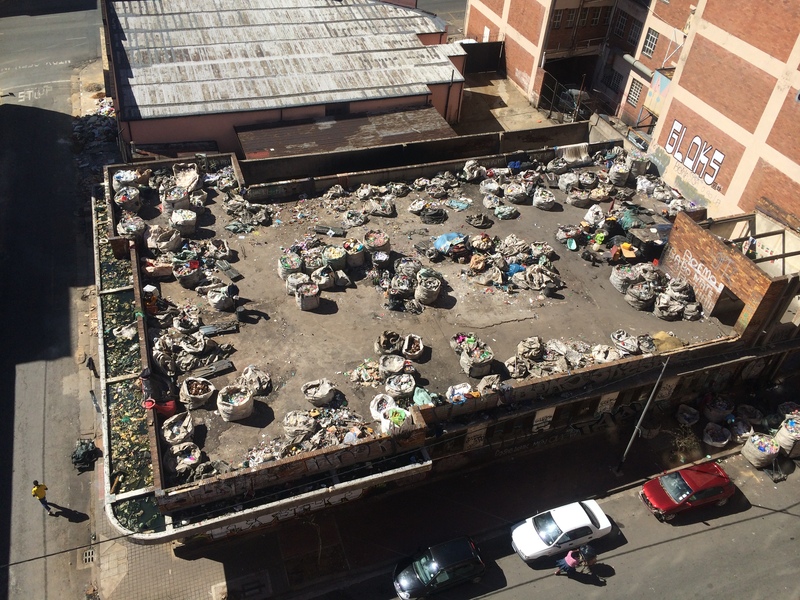 Often, they live in bad conditions with no running water, electricity or sewage, a big problem in Johannesburg. But the kids are so nice, cute and well-behaved! Every day when I arrive for work, they give me an update on the plants; that they are still there, the seeds have not germinated yet and they don’t need water because it has been raining so much. What I also learned is that the people that you’re most vigilant (a very popular word here in SA) about, are often actually nice. The recycling guys for example. These are men, walking the whole city to collect plastic soda bottles, metal and other materials that they can sell. They make an honest living and are working their asses off. I got in contact with one of these guys. He is from Lesotho and was the only one who spoke English. I asked him how much he’s getting for a big bag full off empty plastic bottles: about R40 (2,70 euro). So I made him a deal 30 bottles for R15 (1 euro) to be collected the next day at 16.00 hours. And he was there, right on time, with the 30 bottles. He collected the nicest ones he told me. So the result after a couple of hours work: 4 pairs of hanging gardens made out of old plastic bottles and a vegetable garden. The garden is placed on the border of the nice pavement (Maboneng) and not so nice pavement (Jeppestown). The first link between the two neighbourhoods. Every day people are looking at the plants and ask me why we did it. If I tell them that it is to get people to interact with each other they are surprised. “Isn’t everybody stealing the plants?” they ask. So far not: it seems that such a simple idea can actually build bridges between the neighbourhoods and maybe even between the people. Brilliant! Literally planting the seeds for a better tomorrow! Thanks Jer! I hope it will work and we can make more of them in other neighbourhoods as well. Would like to make street furniture, make public spaces more public so it will become safer. Marrit: great jobs, everything great starts small, needing germination, water and love! Good luck, and hi to the kids out there! Hey Marrit, good to see you’re sharing your creativity there! Like the idea, simple but effective. And cute pictures ;-) !!! !